For smartphone-wielding hordes of tourists, Hong Kong boasts a host of must-have Instagram locations — but crowds of snap-happy travellers are testing local patience and transforming once quaint pockets of the bustling metropolis. Tony Hui recalls how elderly residents always used to play cards in a courtyard in the middle of the densely packed housing block where he owns a dry cleaning store. The buildings in Hong Kong’s Quarry Bay are one of the city’s best known residential complexes, famed for tightly-knit apartments towering above three sides of a thin courtyard. But in recent years, daily throngs of tourists have relegated the card players to a dark corner of the courtyard. “You might say the elderly have made way for the photo takers’ convenience, to not get in their way,” Hui concedes. While the building had long been a draw for street photographers and architecture enthusiasts, social media has helped turn it into a mass tourist attraction, fuelled by it featuring as a location in a recent “Transformers” blockbuster and the remake of the Japanese manga classic “Ghost in the Shell”. A sign warning against shooting photos and disturbing residents has done little to deter the chic travellers who usually form an orderly line to wait for a coveted spot in the middle of symmetrical blocks. A high-end cafe opened in November to cater to this new market — its sleek interiors and bright lighting a stark contrast to the more humble-looking neighbourhood shops and the public housing towers above. Other Instagram hotspots have proven more chaotic. A mural by local graffiti artist Alex Croft featuring rows of tenement houses draws a constant stream of tourists to the steeply sloping Graham Street in downtown Central district. Taxis and cars honk restlessly as the tourists — primarily from mainland China, South Korea and Taiwan but also western nations — spill into the road to get their ideal frame seemingly oblivious to the safety issues. 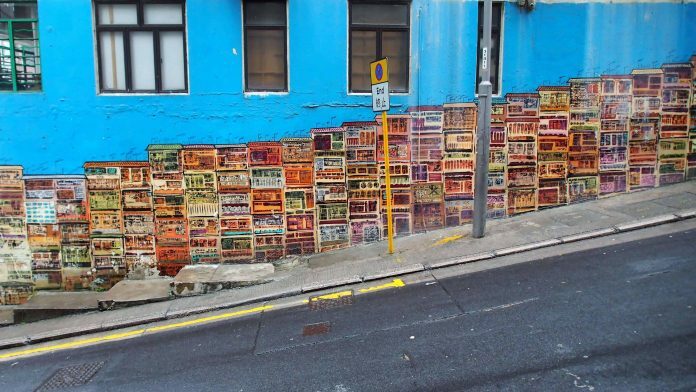 Park Tae and Hwang Seung Min from South Korea had only seen the wall free of interlopers in carefully composed photos on their Instagram feeds so were surprised the street was so busy in real life. “I was taken aback as I didn’t expect the crowds, but it’s good for taking photos,” Park says. For some shops, this heavy foot traffic brings new business: there are queues outside a famous egg tart store and a dumpling house nearby, as snappers stop to refuel. But Toby Cooper who runs popular pub The Globe which sits directly opposite the mural, says the sheer number of people loitering on the road is a safety issue. “We have seen a few people hit by cars and vans on Graham but they tend to be the instagrammers who are transfixed on taking photos,” he explains. Hong Kong’s unique urban aesthetics — especially its public housing estates — have proved enormously popular to social media obsessives. Critics say the crowds help romanticise poverty sharing images that provide only a shallow view of what it is to live in the one of the world’s most unaffordable property markets. Across the harbour tourists and some locals have taken over the basketball courts surrounded by the now iconic rainbow-coloured housing estate in the Choi Hung district, which means rainbow in Cantonese. It is where Korean boy band Seventeen shot a music video and is now being promoted by the government’s tourism bureau. Local resident Chow Keung, a 72-year-old kung fu master, is fairly sanguine about the visitors as he watches them from a bench. “Many people have asked me how to get here and I give them directions, I don’t mind… but I’ve had to ask some tourists not to leave their trash behind,” he sighs. A grandfather surnamed Liu recalls a bygone era when children actually rode scooters and freely played basketball on the courts. Today’s teens have to navigate the groups of photographers as they play. One 14-year-old resident, who gave his name as Yik, says he now fears racking up a bill when he shoots hoops.